If I am absent for a day or two from a driver education school, may I get an excused absence and miss those classes? How can I register for teen driver education? Your best manners and attitude! Days 1-3; learn the Signs, Laws and Rules of Texas Roads. Grade of 70 required on all work! Final Written Exam is given at our location, not DPS! How long is the driving portion of the course and when can I schedule my driving lessons? The driving portion is a total of 14 hours (7 hours driving and 7 hours observing). Driving lessons can be scheduled concurrently with the classroom portion as soon as the student has received his learner's permit. What times can I schedule driving lessons? Driving lessons can be scheduled seven days a week, before or after class, as the student's and instructor's schedules permit. Once a student has registered for the driving education course, made full payment, and received his learner's permit, he can schedule his driving appointments online. What age can teens start the program? Teen as early as 14 years old can register for the driving education course. What should I do if I miss some of the classroom portion of the course? Missed classes can be made up by attending the class during the same day at a different time (if available) or attending the missed class during the next course. Can I make partial payments for the Teen Full Driver's Education Course? Yes. We will accept a deposit to enroll in the course and get started. However, the instructional permit and certificate of completion will not be issued until full payment is made. Do adults 25 or over have to take the 6-hour adult driver education class? No, adults 25 or over are not required to take driver education. 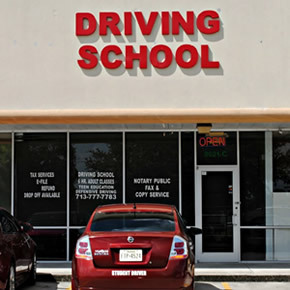 In order to obtain a license; however, adults 25 or over must pass a written test over the Texas Driver's Handbook and an eye exam to obtain a driving permit. Once a permit is obtained, you must pass a driving test with a State Trooper at the DPS office in order to obtain your final license. What is the 6-hour adult driver education class about? The driver education course exclusive for adults includes information on alcohol and drug awareness; traffic laws; highway signs, signals, and markings that regulate, warn, or direct traffic; and issues commonly associated with motor vehicle accidents, including poor decision-making, risk taking, impaired driving, distraction, speed, failure to use a safety belt, driving at night, failure to yield the right-of-way, and using a wireless communication device while operating a vehicle. Will I receive a certificate the same day I finish? Yes. You will be given a certificate which must be presented to the Department of Public Safety when you submit your application for a permit or driver's license. How do I prepare for the permit test? You can study the Texas Driver Handbook on your own or enroll in our 6-hour adult driver education. How do I prepare for the driving test? To prepare for the driving test students are encouraged to take driving lessons with Licensed Driving School.